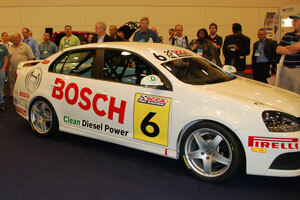 The biggest announcement at the National Biodiesel Conference today was that B5 will be the official fuel of the 2009 Volkswagen Jetta TDI Racing Series. HYPERFUELS, a national supplier of race fuels, biodiesel, additives, and lubricants, has been selected as the official fuel sponsor. Approximately 3,192 gallons of B5 will be used to fuel the diesel race cars as well as the transport trucks and generators throughout the series.